If you have a new pet box turtle and are thinking it is just a cute, gentle little herbivore, you are in for a surprise: box turtles are actually omnivorous with a strong carnivorous streak! They are also skilled hunters and enthusiastic eaters. Smart, energetic, and attracted to anything that moves, your box turtle will enjoy “hunting” live prey, such as worms, insects, and small shellfish, more than many of its turtle peers. But as it grows, your box turtle will also need to eat plenty of plants, fruits, and fungi to ensure its nutrient intake is well-balanced. It may also need to hibernate as this is something that box turtles do in the wild. 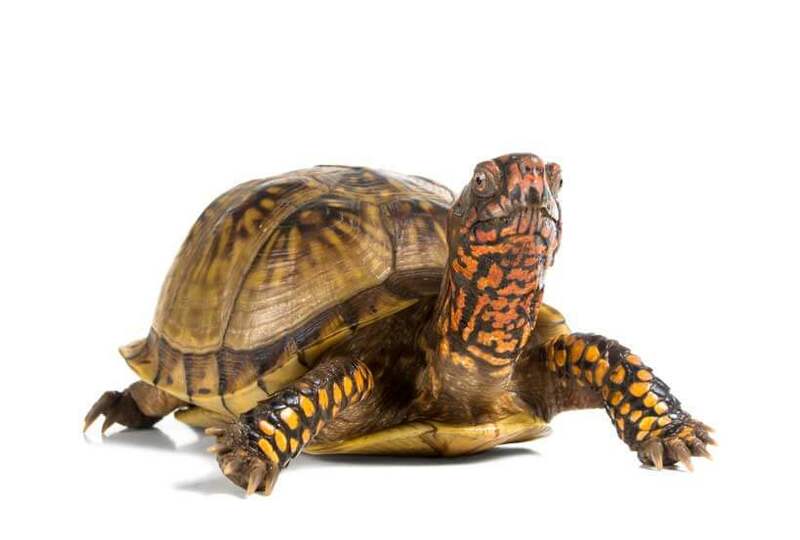 Read on and you will find general guidelines on caring for a box turtle’s dietary needs as it develops from a baby, to a juvenile, to an adult. If you are interested in learning more about hibernation you can skip ahead. you are providing care to a baby box turtle, you will need to be sensitive to your baby’s feeding needs. For example, because a baby turtle’s tiny jaws make it difficult or impossible to grasp and swallow a whole worm or snail, you can help by cutting the food into smaller pieces. Be sure to watch your baby box turtle closely when it feeds to make sure it is able to easily consume the food it’s given. 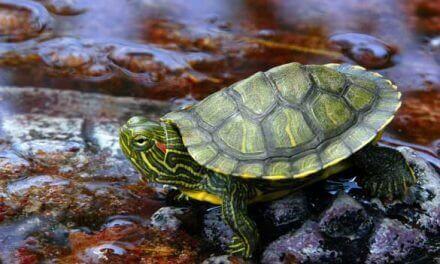 You might find that younger turtles may not show much interest in eating when you first bring them home. In the wild, a new-born box turtle will feed from its yolk sac for about the first 5 days after hatching. After that, they are sometimes more interested in hiding than feeding. To make sure your baby turtle gets the right nutrition at this age, you will likely have to physically lift it out of its hiding spot and place it in front of the food. To minimize stress on your hatchling, try to be consistent in offering food at the same time as when you change the water, remove soiled substrate, and provide its daily soak. 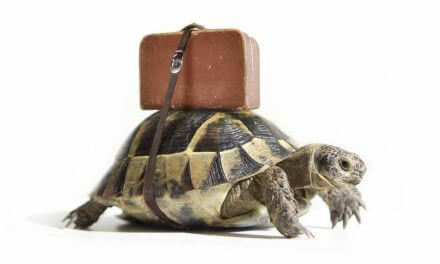 minimize stress on your baby box turtle. How much protein is too much for my box turtle? baby box turtle should be provided a daily menu consisting of about 70 percent protein sources and 30 percent vegetation/fruits/fungi. Do not worry if your baby box turtle doesn’t touch the vegetation portion at first – your turtle will instinctively know when it is time to start consuming more plant matter. For older juvenile and adult box turtles, you should shift to a diet of 50 percent protein and 50 percent vegetation/fruits/fungi. While you may feel tempted to offer more protein, especially when your turtle is young and seems partial to it, offering too much protein too early can interfere with proper shell development and cause health issues later in life. What types of protein are good to feed your box turtle? the wild, baby box turtles hit the ground running – literally. With no mama turtle hovering and hunting food for them, hatchlings must find their own food and shelter…or else. For this reason, even newborn baby box turtles show immediate response to movement, making live prey a perfect partner in enticing them out of hiding to eat. For captive adults, the enriching activity of hunting and snaring their own prey is a daily highlight. 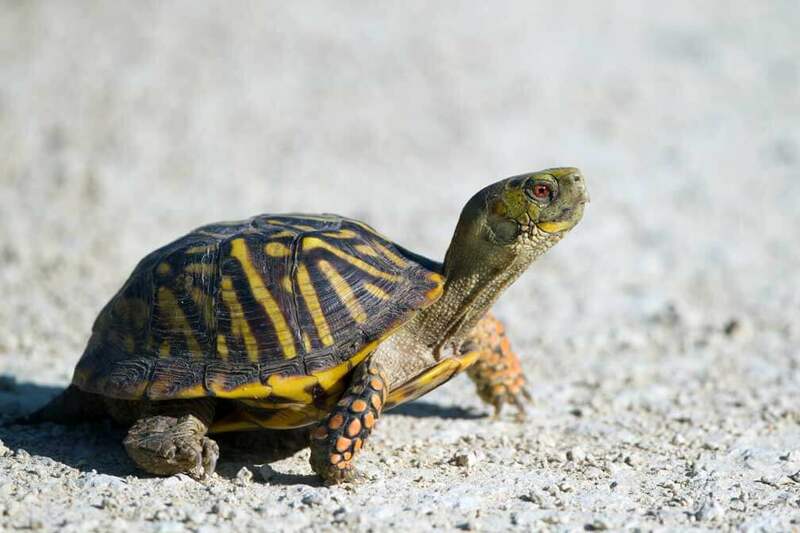 There are many great sources of protein you can offer a box turtle at any age – just make sure you provide bite size portions to a baby box turtle because of its smaller jaws. Mealworms may not be the most exciting creatures to you, but your box turtle will love them! You can find them, live, frozen, freeze-dried. 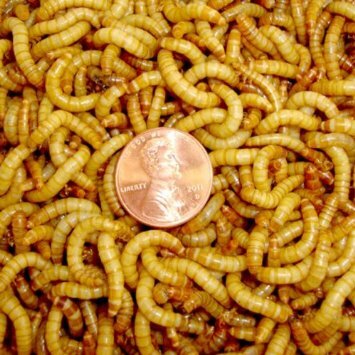 We love the 1100 Count Live Mealworms organically grown and sold by Gimminy Crickets & Worms. You can find them on Amazon, and the worms come about one inch to one and a quarter inch long. If you do choose to get live mealworms for your box turtle, be sure to mention if you are living in an area with a hot climate. Giminy Crickets & Worms will pack the mealworms so they are more spread out and do not overheat each other. If in contrast, you live a in a colder climated area, they will package the mealworms with a heating pack to keep them alive. Your box turtle will love following its natural instinct by hunting after live worms. Waxworms are another squirmy way for your box turtle to enjoy getting protein. The are a common food used for all kinds of small animals including birds and chickens, as well as fishing bait. 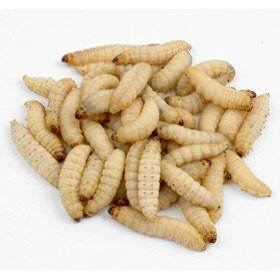 As with mealworms, you can order wax worms to be shipped via mail. Amazon has some great choices. Once you receive your wax worms, you want to be sure to store them the right way. If stored properly (between 55 and 60 degrees), they will become dormant. Because of wax worm’s high fat content, they are a wonderful food for your box turtle. Deshelled snails are an easy alternative to live prey. They are another good source of protein and nutrients for your box turtle. 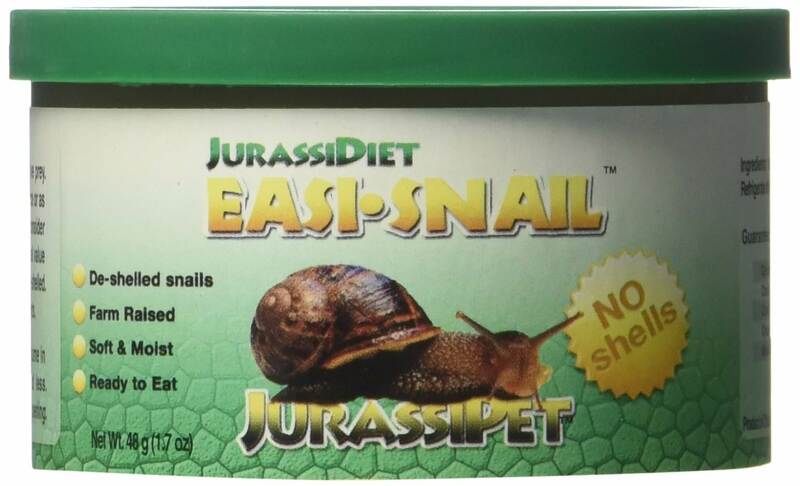 We like EasiSnail’s by JurassiDiet. They package them in a way that locks in moisture so that they are not overly dry, and are a great treat for your turtle. Another alternative to live insects are packaged grasshoppers or crickets. They are also perfect for traveling or as a special treat. Grasshoppers have a collagen protein that has fiber which helps your box turtle build healthy bones, cartilage, skin and claws. Grasshoppers can also be soaked in water to rehydrate them, or to soak up any medication your turtle may need if it falls ill.
We like Health Herp Dragon Treat because it is all natural, and contains no preservatives. Whatever kind of grasshoppers or crickets you choose, be sure they with limbs/antenna and any hard exoskeleton removed for baby box turtles. Some other protein alternatives for your box turtle are earthworms, super worms, shrimp, silkworms and commercial box turtle food. If you choose to buy commercial turtle food for your box turtle, be sure that you use it as a supplement only, and not as a main source of nutrition. SAFETY NOTES: Do not be tempted to “harvest” your box turtle’s menu from your backyard or a local park. You won’t have any way of knowing if the vegetation or insects you bring home have been exposed to pesticides or other poisons. Where should I feed my box turtle? It is certainly reasonable to feed your box turtle inside its main turtle tank, but this may translate into more cleaning for you. 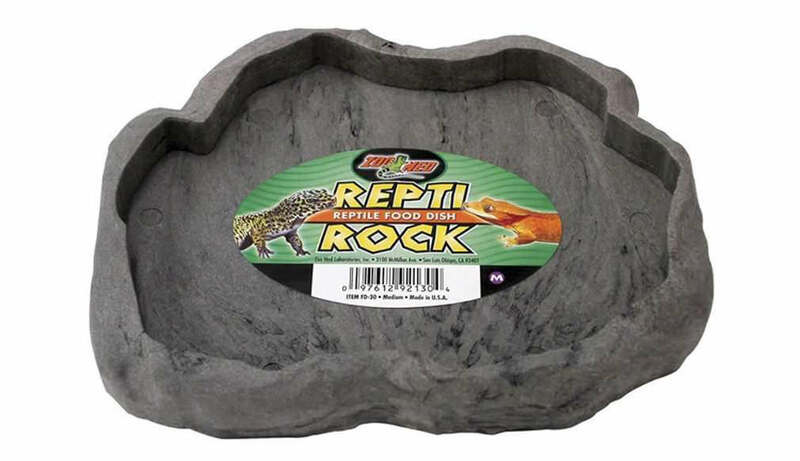 Many box turtle owners like to remove their pet turtles to a separate, smaller feeding enclosure to minimize this necessary unpleasantness..
To help your turtle keep its beak (jaws) naturally trimmed, you can offer the food on a flat, natural rock feeding dish sized appropriately for your turtle. How much should I feed my box turtle? Box turtles may seem shy and fearful as babies, but this is because they have a strong instinctual need to hide from predators. As your box turtle matures, you will see its true personality emerge. For the most part, box turtles are social, active, energetic and intelligent beings. They are also, what scientists call, “opportunistic feeders,” which means, if food is there and it tastes good, they will probably eat it. 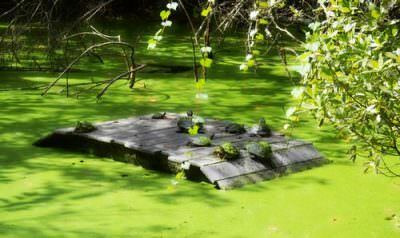 In the wild, opportunity feeding is a wise strategy that prepares a turtle for the threat of lean times. In captivity, this can lead to plump box turtles that can’t close their shells or retract their limbs all the way into their shells. 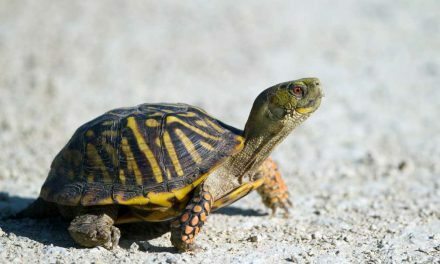 To avoid overeating, a general rule of thumb is to only provide an amount of food at each meal that your box turtle can consume in about 15 minutes. You can experiment for a few days to determine how much food that is for your turtle, then consistently offer that amount at future meals. 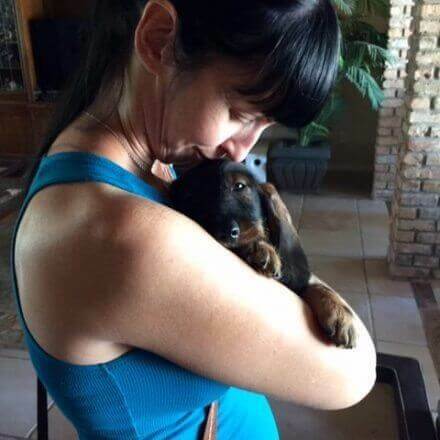 You can also offer small treats once per day if you want extra enrichment and interaction with your pet. How often should I feed my box turtle? 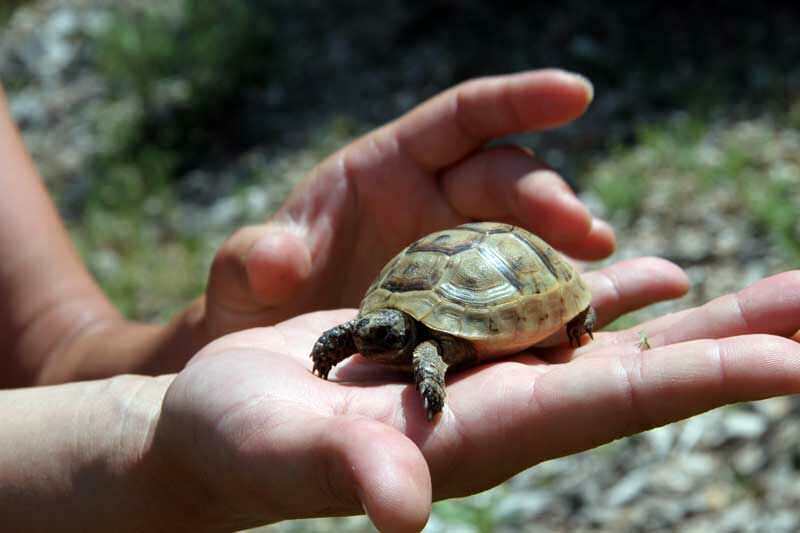 Baby box turtles should be fed once daily – ideally at the same time each day. If your baby turtle does not eat every day, especially at first, do not worry; offer the food daily, anyway, and monitor. If your turtle goes for several days without feeding, take it to your exotic vet for a checkup to see if there might be a health reason for this behavior. Once your turtle grows into adolescence, you can offer the food every two days, then adjust as needed when it becomes an adult. Does my box turtle need extra vitamins or nutrient supplements? no diet provided in captivity will fully replicate the full range of nourishment your box turtle would find in the wild, supplementing with vitamins and calcium is a must. 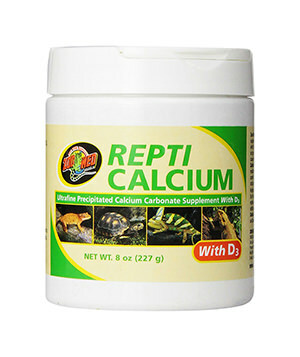 Your turtle will need calcium with D3 and a good turtle multi-vitamin, plus unlimited access to a turtle bone for extra calcium, as needed. Calcium is essential for strong, healthy shell development. You can just dust your turtle’s food with the supplement powders, as instructed by the manufacturer or your vet, and leave the turtle bone in your box turtle’s habitat on a persistent basis. What vegetation and fruits should I add to my turtle’s diet? vegetation, dark leafy greens (dandelion, carrot tops, collard, mustard) are all great choices, but avoid spinach because it can leech calcium. Green beans and clover are also excellent options. Good fruit sources include berries, melon, kiwi, and apples. You could also include whatever fungi your local grocer sells. 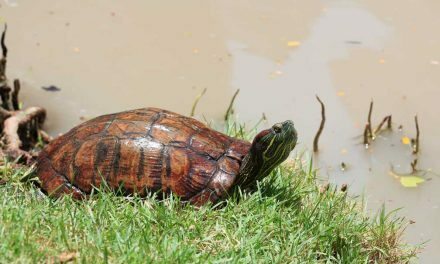 Box turtles, like most turtles, tend to seek out their water in equal measure for drinking, soaking and excreting, so you should offer clean, safe, fresh water 24/7 and change your turtle’s water dish frequently. Offer only spring water, filtered water, or dechlorinated tap water. Never offer distilled water because the process used to remove the dangerous heavy metals also removes all the good minerals that your turtle needs. Be sure to use a water dish that is easy to clean and sanitize. Should I offer food during hibernation? 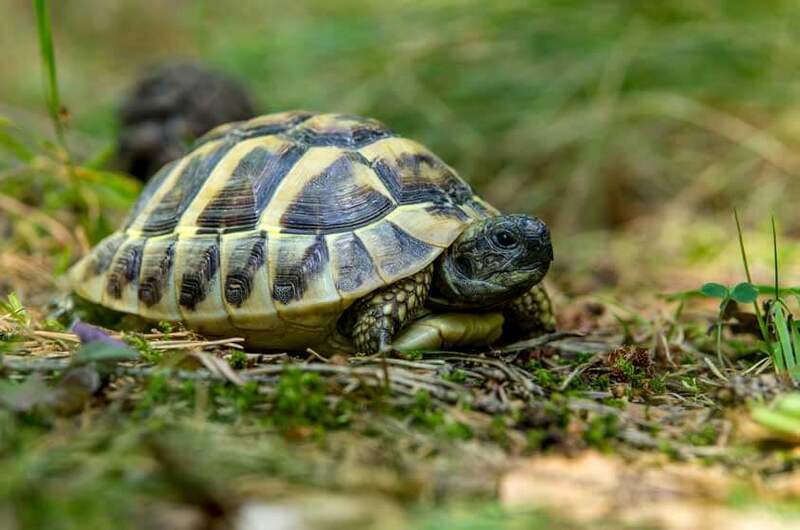 your box turtle is 3 to 4 years or older and showing signs of getting ready to hibernate (e.g., eating less and slowing down its activity), you should consult with your vet to see if it is healthy enough for hibernation. If your vet gives the green light, follow the vet’s specific guidance for caring for a hibernating box turtle. This will include specifics like eliminating food and offering soaks two weeks prior to the projected hibernation start date. 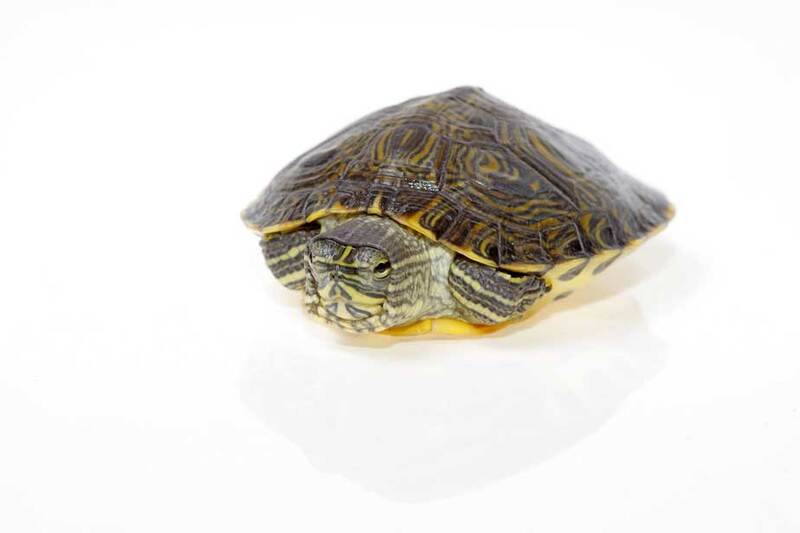 If you have a question about other foods you would like to offer your turtle, or about any additional dietary supplementation, be sure to check with an experienced box turtle breeder or your exotic veterinarian first so you know that it is safe.